PART 2: HonestReporting has documented how the vast majority of articles and editorials in the New York Times depict Israel in an unfavorable and often erroneous way. Yet the NY Times might argue that its coverage is negative because Israel’s actions and policies warrant such coverage. In other words,it would claim to be simply reporting the news rather than presenting a biased viewpoint. Terminology: Percentage of articles where inaccurate terms are used to Israel’s disadvantage. When Hamas terrorists are labeled “militants,” their true nature is hidden. When terms like “right-wing,” “hawkish,” and “nationalist,” are applied to the Israeli government and not to Abbas’ Palestinian Authority (which has shown far less flexibility in the peace process), it gives the impression that the lack of progress is primarily due to the make-up of the Israeli government. The use of these misleading labels is so common that many readers see nothing wrong with headlines such as “Israel Orders Airstrike Against Gaza Militant.” But certainly, a headline and article that describe a strike against a “terrorist” (and that’s what those who launch rockets at civilians are by any standard) would have a much different impact. Unfortunately, this is an area where the Post and LA Times also have work to do. For some reason, when it comes to Israel, journalists will do anything to avoid using the dreaded “T” word (terrorist). At least the Post mentions the rocket attacks in the headline “Israel fires missile at motorcycle rider in Gaza it says was responsible for rocket attacks.” Although the key words are in quotes, the LA Times uses “Israel kills two in Gaza strike targeting ‘terrorist operative.‘” It should be noted, however, that the LA Times ran the article with a completely inappropriate picture of the terrorist’s mother weeping at his funeral. Sources: Percentage of articles that use direct quotations critical of Israel that are from questionable sources or are factually suspect. While a direct quotation can bring clarity and insight to an article, there are many ways that quotations can instead distort an entire article. If the quotation is inaccurate or from a source that is biased or has a history of spreading false information, then it will do more to confuse the issue. Even when a quotation is balanced by another viewpoint later on, if it is more prominently placed in the article, it will also steer the reader to one perspective. This is especially troubling when dealing with people who live in a situation where saying the wrong thing publicly can lead to harm for themselves and their families. But this is not true. So even if a high ranking official said it, the NY Times is under no obligation to publish it. “I feel like I’m not a human being – we are serving the occupation,” said Mr. Jalaita, 47, a father of five, two of them university students. “I am forced to work here because I have a house, I have a family. Tomorrow, if there is another place to work, if there is work in Palestine, I will do it. But was this quote honest and truthful? Under the Palestinian Authority, one can be targeted for saying the wrong thing. Can we take this source at face value? Yet incitement is a real issue and has been heavily documented. Why should the Post publish Ashrawi (who has a fairly consistent record of providing biased and inaccurate quotes to the media)? The way the New York Times covers Israel displays a clear bias. We have analyzed its coverage on its own merits and compared to other leading American newspapers — that are not known for being pro-Israel. In all our studies going back over many years, it has shown a consistent bias, reporting negatively on Israel and Israeli actions. Negative stories far overwhelm positive ones, important context is lacking, misleading terminology is used, and quotations showing subjective bias influence readers to have a poor impression of Israel. 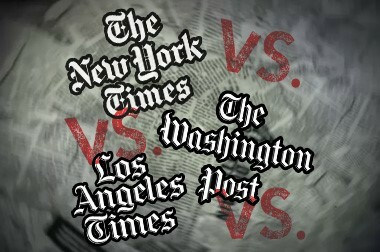 We intend to follow the New York Times, as well as the Washington Post and the LA Times throughout the year to see if coverage improves. At the end of the example of the Times’ use of Terminology to present a biased report, Mr. Frankl writes, “a headline and article that describe a strike against a “terrorist” (and that’s what those who launch rockets at civilians are by any standard) would have a much different impact [on the reader].” Do you agree with his assertion? Explain your answer.